According to John Gadbury, writing in London in 1665, comets were "Threatening the world with famine, plague and death". In fact he goes on to say that princes would meet an untimely end, sailors would have to ride out storms and generally everyone was in for a very rough ride. However, not all civilisations saw the arrival of a comet in the same way. On the reverse of a Roman coin in the reign of the first Roman emperor, Caesar Augustus, there appears a picture of a comet with eight rays and a tail. This design was in honour of his stepfather Julius Caesar. The Romans had taken the appearance of the comet to mean that Julius Caesar had risen to take his place amongst the gods themselves. His stepson commissioned the coin hoping to bask in the reflected glory of having his stepfather promoted to a god. To learn something about these sporadic visitors to our neighbourhood we invited Prof David Hughes from Sheffield University to come and talk to us. Professor Hughes began his academic career studying the dust that peels off comets as they approach our Sun. He was part of the research team that sent the spacecraft Giotto to investigate the infamous Halley's Comet and is presently involved in the Rosetta mission to put a spacecraft in orbit around a comet. The first close flyby of a comet by spacecraft was in March 1986 when no less than six different spacecraft visited it within a month. The first to reach the comet was Vega1 a Russian probe that was primarily launched to study Venus. The other five craft were: its sister craft Vega2, two Japanese comet-chasers, an American spacecraft called ICE and Giotto. Of all the spacecraft, the European Space Agency's probe Giotto came the closest; to within 600km or about 370 miles. After this successful encounter it then went on to another comet (Grigg- Skjellerup) and ventured even closer - to within 200km. 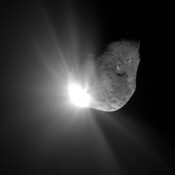 Recently NASA have been in the news with their successful Deep Impact mission to, literally, impact with a comet. Their "washing-machine- sized" bullet crashed into Tempel 1 on July 4th 2005 at a time of day when most of the world's largest telescopes could watch events unfold. The impact at 23,000 mph threw up a huge cloud of material that is thought have the consistency of talcum powder. Unfortunately, this powder blocked the view of the newly-formed crater from cameras aboard the main spacecraft and scientists are having to use other means to try and determine its depth and width. Initial reports show that it may be up to 250 m across. It will take scientists months if not years to examine the Gigabytes of data they have from just this one mission. Just in time to look at more data from the Rosetta mission which is already on its way to comet 67P/Churyumov-Gerasimenko. If all goes to plan Rosetta will arrive at 'C-G' in May 2014 and go into orbit around it. For cometary scientists the icing on the cake will be later that year when a lander finally touches down on the comet's surface.